Quote from Mark at ESS boardstore "The RED is so much better than those other inflatables its not funny"
And from Sydney Supgear superstore "We choose to stock RED over the others because RED boards are obviously superior." Red inflatable boards use only the very best military grade materials for a unique fused skin construction that has proven itself a thousand times over worldwide. Besides the massive easy transport, storage and durability ding proof advantage when not paddling, how the Reds compare to solid boards and foamies on the water is the main query we get. Reds wont ever feel anything like a solid surfboard in real waves, (no inflatable ever will) but they do have many clear advantages. ·	Glide – flat water or going out over surf, the red inflatable absorbs and glides, particularly noticeable paddling up swift flowing streams with almost magic self propelling vortex effect ! ·	Fun – catching a (small) wave on a Red is really fun because you can muck about, run your mate over, jump and fall off without any injury or damage worries. You can throw these boards off the roof onto the tarmac then jump on them, Take them whitewater paddling down rapids into (smooth) rocks, I have seen a Red bent double around a log with tons of whitewater cascading meters into the air for 10 minutes until the log broke... my RED was fine. You can hit them with a hammer, drop them, use them as a trampoline. There is simply no comparison. A repair kit is supplied in case you ever get a puncture. We have not had to use it yet touch wood. The generous backpack storage bag is about 80x40x40cm including pump ! the 10' weighs about 10kg, generally lighter than solid boards by volume. Red collapsible paddles will be available soon, but actually we have found that a one peice paddles performance, light weight and reliability is always worth transporting for us. 9'4 is the most surf oriented, even without a paddle ! The 10'6 is the most stable at 32" wide with loads of volume for bigger loads. The 10' board is a fantastic all rounder and quick to pump up. And finally the 11' board tracks better, glides more and is the fastest of all 4. All the boards are great for taking the kids, and the larger 2 can easily hold an extra adult bod. All Red Air boards are very versatile. With the standard hand pump it can be less than 3 minutes without too much effort, shorter when assisted by an electric pump, and better again when using a compressor / scuba tank. Once its reasonably clean and dry twistlock the valve open then flip it upside down and roll it up starting from the tail keeping the fins reasonably straight. Secure it with the webbing strap then slide into the backpack. Very quick and easy compared to roof racks. More UV proof than anything else. Hire boards 12 months permanently inflated on the beach no cover.... apart from a little grip fading they are all perfect. And lost no pressure ! Next to none... Wash the board then dry it before storage, keep the valve and pump clean and maybe lubricate the pump shaft every now and again. NEW* River & rapid running: Of course the qualities of the RED air inflatable boards and base paddles lend themselves to Running rapids. And yes you can do it however it may void warranty and naturally presents risks that users must take sole responsibility for. 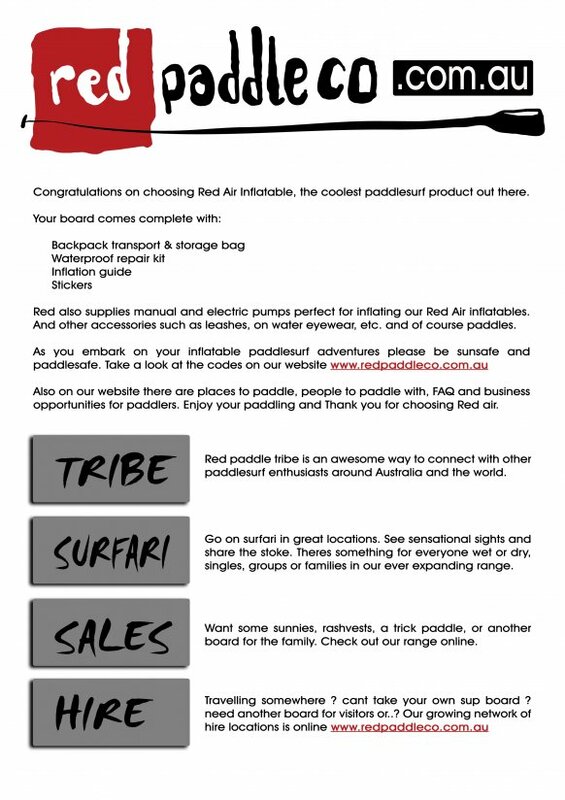 As with all paddling Redpaddleco and its distributors refuse any and all liability connected with river running. That said if you choose to explore this new sensation, please consider to join a reputable river sup tour such as in our products section for your first outing. Take it in steps starting with slow running water before trying serious white water. On the river sit or lie down the 1st time you approach anything you are unsure of. And take note of our river SUP rules below. 1: Helmets, flotation / impact vest, and appropriate protective footwear are considered essential for white water. 6: Respect the environment, wildlife and other peoples property. 7: Check the weather and water levels before and during any run.